I love my job. * I love my job so much and for so many reasons. My colleagues are amazing: I belong to a book club, social committee, and an informal poetry class with the great people there, not to mention how awesome the people I chat with throughout the day, and go to lunch and happy hours with are. My supervisors are also amazing: They're smart, diligent, and fair. The books we publish are real works by real writers: they contribute to scholarship, win awards, and hold my own interest. During the day, I feel independent, responsible, and like I'm contributing to something bigger than myself. The work is challenging, interesting, and meaningful, and when it isn't, being a part of a company I believe in more than makes up for it. 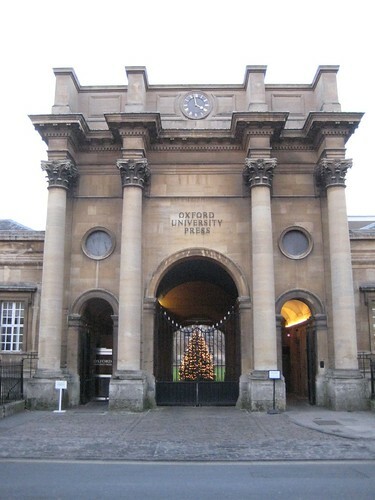 As was once pointed out to me, Oxford University Press was around long before I was born (we opened for business, more or less, in 1480), and it will be around long after I am gone. I love this, also. But the real, most deeply ingrained reason I love my work, is, I think, this: When I was studying at Oxford, we visited the press, and I held the typesetter's block for Alice in Wonderland's "The Mouse's Tale" in my hands. I held it in my hands. It was beautiful, swirling, magical, and OUP was the only place it could be done. Being at Oxford felt so deeply like that beautiful, swirling, magical place inside the text, and for that moment, I was holding it in my hands. That moment has passed in so many ways, but working here allows me to keep it alive in a small way. Everyday, I get to walk through our gold revolving doors, tap my feet along our marble floor, past twin fish fountains and the conference room where I first heard the details of attending Oxford, and help someone else hold that feeling in their hands. At the risk of truly sounding like a commercial, OUP is a department of the University of Oxford, and we are a not-for-profit educational publisher. This is more important to me than I can say. *Yes, I took a seven-month break from it after working there for a year-and-a-half, and yes, of course, there are days when I am stressed, frustrated, and cranky about it. But overall, I'm happy to be there, and so grateful I can say that. I don't know whether I'm really allowed to write about it on here, but since I only have wonderful things to say about it, I'm hopeful this won't get me fired. Rah for having a job you love, and that is personally fulfilling. And in coworkers you like and I can see why you're so happy! How cool! I'm a little envious.